Velvet material ¨C These hair bands are made of softer velvet, good texture, shiny and and comfortable, each hair band with a durable rubber band, can fix your hair well and will not hurt your hair. Good assistant ¨C Suitable for daily wearings and different occasions like parties, ceremonies, office, school, travel and so on. Meanwhile, they are fit for curly hair, straight hair, ponytail, buns, thick or thin hair. Wide application ¨C Our velvet scrunchies can be applied in various occasions, you can wear them attending parties, ceremonies and daily wearing, practical and useful for you. 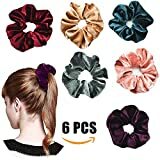 Fantastic hair bands ¨C Good assistant for your make up and easy to DIY your own hairstyle, make you become more beautiful in various occasions. Package includes - 6 pieces and 3 pieces of velvet hair bobbles, each color for 1 piece, enough for you to wear in daily life, also a good selection for your friends and families.